« Homepage / Other Drugs / "Remergil 6 mg / 2 ml / – 15 mg / 5 ml concentrate"
Mirtazapine is used for the treatment of medium to severe depression. The active ingredient is administered as a solution, or in the form of tablets or melting tablets. Mirtazapine belongs to the Group of Tri and tetrazyklischen antidepressants and increases the concentration of the body’s messengers of dopamine and norepinephrine in the brain. The mirror of both signalling substances are often abased in depression and responsible for the typical symptoms such as depression, lack zest for life, lack of drive and restlessness. To start using mirtazapine has a strong calming and dampening effect, what can be used in the treatment of anxiety disorders. The effect of mood enhancing adjuvants as only when inserts the most antidepressants after about two to four weeks. Much more is, however, already a drive increase in the patient. Compared to the classic tricyclic antidepressants, the tetrazyklische mirtazapine is characterised by very few side effects. The Elimination of mirtazapine in patients with kidney or liver deficiency can be reduced. A unique gift of the total daily dose of Remergil is indicated in this patient population. So far the drug may affect the responsiveness that driving and using machines are dangerous. This applies particularly in the interaction with alcohol. Older patients more often respond to treatment with the drug. The drug should be slowly dropped to end the treatment to avoid withdrawal symptoms. In the second week of treatment, the risk of suicide may be temporarily increased. Severely depressive and young adults under the age of 30 have a special risk of suicide and must be closely monitored accordingly. The drug can cause an increased risk of bone fractures. 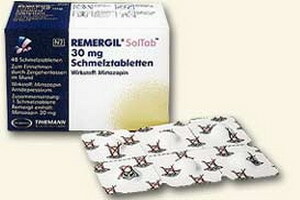 Remergil should be diluted with a pour glucose Infusionslöung. Only clear, particle-free solutions may be used. The infusion solution should be infused slowly over the period of two hours. Store the concentrate for infusion solution in its original packaging not above 30 ° C.
Caution in diabetes, epilepsy, with increased intraocular pressure, glaucoma, liver and kidney deficiency and to low blood pressure. Medicines can cause allergic reactions. Evidence for this can be: redness, runny nose, itching, swelling of the mucous membrane, itching and redness of the eyes, narrowing of the Airways (asthma). In rare cases, there may be allergic shock with loss of consciousness. What interactions of active substance of mirtazapine in Remergil are aware of 6 mg / 2 ml / – 15 mg / 5 ml concentrate? It is important to note that the interactions can be different depending on the pharmaceutical form of the drug (for example, Tablet, syringe, ointment). Mirtazapine should be administered with antidepressants from the Group of the MAO-inhibitor, because the effects are mutually reinforcing. When switching the two active substances, a break must be kept at least two weeks. Also, mirtazapine enhances the mood-lowering effect of sedatives such as benzodiazepines and the dampening effect of alcohol (renunciation of alcohol during treatment). The simultaneous use of mirtazapine with HIV-1 protease inhibitors, erythromycin, nefazodone, or mushroom funding from the Group of Imidazoline and Triazole must be monitored carefully by a physician because these agents inhibit the breakdown of mirtazapine and thus increase its impact. Also by cimetidine, a stomach acid binder from the Group of the H2 blockers, reinforcing the effect of mirtazapine. On the other hand, mirtazapine is rifampicin and antiepileptic phenytoin and carbamazepine faster dismantled by the antibiotic and thereby mitigated in its effects. The combination of mirtazapine with anticoagulants like warfarin increases the risk of bleeding and requiring regular medical checks. Treatment for adults should begin with a daily dose of 6 mg (two millilitres concentrated product). She will increase usually gradually to up to 21 milligrams (seven ml concentrate). For example, each six milligrams (two millilitres concentrated product) can each nine milligrams (three millilitres concentrated product) on the first and second day, the third and fourth day and each 15 milligrams (five millilitres concentrated product) be given to the fifth and sixth day. In the following one to eight may days, if necessary, increase the daily dose gradually further to 21 milligrams (seven ml concentrate). The recommended dose for elderly patients is equivalent to the adult dose. A dose increase should be done under comprehensive controls. Only in this way, a sufficient and reliable effect can be guaranteed. Remergil should not be administered children and young people under 18 years of age. The required dose of Remergil concentrate for infusion solution should be diluted with 500 milliliters of a pour glucose solution. Remergil is given with a sterile syringe into the infusion solution. The solution needs to be shaken to ensure an even distribution of the active substance as before the infusion in a forearm vein. It can be used any standard infusion set for this purpose. The cannula or a fine needle should be fitted with a flange to keep them in position. The infusion solution should be infused slowly over the period of two hours. During the infusion, patients must be carefully monitored. This applies particularly to the blood pressure. Intravenous should be about 7 to 14 days. After the impact, the gift of infusion should be stopped. This is usually 7-14 days. The therapy continues then usually melting tablets (15 to 45 milligrams daily) as of Remergil. The following information about contra-indications in the application of 6 mg / 2 ml / – 15 mg / 5 ml concentrate in General, pregnancy & lactation, and children of Remergil. It is important to note that the contra-indications can be different depending on the pharmaceutical form of the drug (for example, Tablet, syringe, ointment). When may Remergil not be used 6 mg / 2 ml / – 15 mg / 5 ml concentrate? Eye inner pressure increase (green star) or acute narrow-angle glaucoma. The coadministration of HIV-1 protease inhibitors, erythromycin, nefazodone, or mushroom funding from the Group of Imidazoline and Triazole must be carefully monitored by a physician because these agents inhibit the breakdown of mirtazapine and thus increase its impact. The application of mirtazapine during pregnancy can be an increased blood pressure in the lungs (pulmonary hypertension) in the newborn. The use of the active substance should be done only after careful weighing of benefit and risk by the doctor, as well as under strict medical supervision. Mirtazapine is transferred via breast milk in the infant. To avoid damage of the child should be breast-fed off before being treated with the active substance. Mirtazapine may be applied not to treat children and young people under 18 years of age, since it came during the treatment of these patient groups increased to suicidal thoughts, suicide attempts, as well as hostility and aggressiveness towards others. In addition, also long term data ensuring of growth, maturation, and mental development are missing. What side effects can the active ingredient of mirtazapine in Remergil have 6 mg / 2 ml / – 15 mg / 5 ml concentrate? Below, you will learn the most important thing possible, well-known side effects of mirtazapine in Remergil 6 mg / 2 ml / – 15 mg / 5 ml concentrate. These side effects should not occur, but can. Because everyone reacts differently to medications. Please also note that the side effects in type and frequency can vary depending on the drug form of the drug (for example, Tablet, syringe, ointment). Specialties: Patients with depressive disorders show a series of disease-related signs and symptoms. That is why it can be difficult to judge which symptoms to the disease and which are due to the treatment with mirtazapine. Mirtazapine to quickly deposed, there may be temporary nausea, anxiety and arousal. The dosage should therefore gradually be reduced (creep). The widespread use of the active substance showed that taking can lead to an increased risk of bone fractures.